Beacon Knoll is a residential community established in 1988 that has grown to over 190 homes. The community is comprised of two parts – a single family home area and a multi-unit gated community called Beacon Knoll Villas. The community includes a recreation area and Common Area that includes a pool, tennis courts and clubhouse, plus two stocked fishing lakes. Beacon Knoll is managed by the Beacon Knoll Homeowner’s Association. The Beacon Knoll HOA is responsible for maintaining the Common Areas plus the recreation facilities, and the two lakes. In addition, the Association is responsible for ensuring that the provisions of the Covenants of the Association are upheld. The Covenants, Bylaws, and other key documents for the Association are listed on the website along with additional information regarding Beacon Knoll information. A brief summary of key items regarding Beacon Knoll is listed below. Beacon Knoll Villas has a separate HOA that is responsible for items specific to the Villas including Villas common areas, building maintenance, roads, the entrance gate, etc. 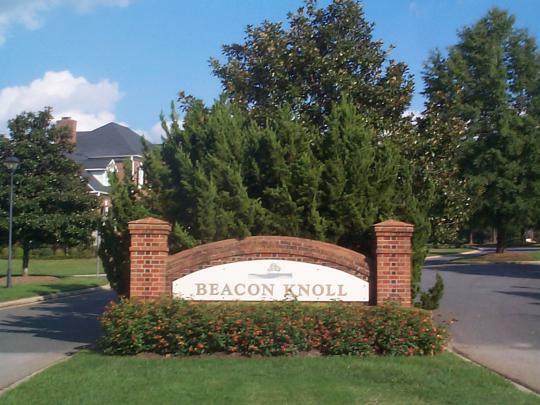 All residents become members of the Beacon Knoll Homeowner’s Association when they purchase a home or lot in Beacon Knoll or Beacon Knoll Villas. The Covenants are attached to the deed for each property within the development. Beacon Knoll Villas has a separate Homeowners Association and additional Covenants for the management of common areas and property within Beacon Knoll Villas, . To cover the cost of maintenance of the Common Area grounds, operation of the clubhouse, running the recreation area, street lights, insurance and other general expenses of the Beacon Knoll Homeowner’s Association, an annual assessment is maintained. The current annual assessment for single family homes in Beacon Knoll is $640. This assessment is due in payments of $320 billed on January 1 and July 1. The annual assessment for townhomes within the Villas is $428 per year and is currently included in the Villa owners’ quarterly assessment. A Board of Directors that is comprised of elected members of the Association administers day to day operations and activities of the Beacon Knoll Homeowners Association and Common Areas. Current members of the Board are listed on the Association website. Specific rules for use of the community pool and tennis courts can be found on the website. The pool is open from 8AM to 10PM during the summer. There are no lifeguards so please make sure all pool rules are observed. Children under 14 must be accompanied by an adult or guardian. Keys to the pool and tennis courts may be obtained by contacting a Beacon Knoll Board member or emailing the Board at bkhoaboard@outlook.com. Beacon Knoll has a clubhouse that is used for community events as well as private events. The Association charges a rental fee for private events. Please refer to the website for clubhouse rental policies and procedures. All Beacon Knoll owners and residents have access to the two lakes within Beacon Knoll. Canoes, kayaks and non motorized boats are allowed on the larger lake. Fishing is allowed on the smaller pond from the Lake Pointe Drive side and the dam area between the two ponds. The side behind the houses on Beacon Knoll Lane is private property. In addition to the website and emails, the Board will periodically distribute hard copies of announcements via U.S. mail or placing them in your paper box. Should you have questions for the Board you can contact any Board member directly, send the HOA an email at bkhoaboard@outlook.com or mail the Board at the address below. The Beacon Knoll HOA operates and maintains the Common Areas within Beacon Knoll. The current annual budget for Beacon Knoll HOA is approximately $100,000 per year. The largest segments of the budget are Landscaping and maintenance, Pool Operations, Clubhouse Operations, General Costs such as insurance, and funding a Capital Expense reserve for major one time items such as clubhouse roof replacement, pool resurfacing, tennis court resurfacing, etc. A copy of the budget may be obtained by emailing the board at bkhoaboard@outlook.com. The Beacon Knoll HOA Board of Directors meets each month at 7PM on the 1st Monday of the month. All meetings are open to Association members.